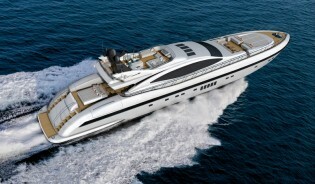 Overmarine Group announces sale of first Mangusta 132 Yacht – Superyachts News, Luxury Yachts, Charter & Yachts for Sale. The Mangusta 132 yacht model clearly highlights the recent technical and style evolution of Mangusta yachts. Her external lines are the traditionally distinctive ones, racy and sporty, to which the aesthetic and structural innovations introduced on the recent models have been added: the new glazing on the main deck, a single window by the salon which offers excellent visibility from the inside letting in copious amounts of natural light; the new line of the flybridge which is more modern and aggressive with aesthetic grating; and the extremely spacious sundeck which lends itself to being used as a private area for the Owner. It can also be fitted with a second helm so those aboard can both relax and enjoy the exciting experience of sailing at high speeds. The external design blends with the technical developments too: a new hull to which all the hydrodynamic improvements which were already on Mangusta 165 have been added, as well as new engines, the waterjet propulsion system and Zero Speed gyroscopic stabilisers (at anchor and underway). Everything contributes to further improving onboard comfort and increasing the range of uses for which this yacht can comfortably be utilised. In fact, it is now possible to sail even at low speeds with lower consumption and increased comfort. The Maxi Open luxury yacht Mangusta 132 has been designed and developed based on the wishes and requirements of her Owner. As this was his second Mangusta yacht, he knew exactly how to use the potential of this model to the full. The onboard volumes are highly impressive and the yacht offers a top performance, understood mainly as being quality, excellence and onboard wellbeing even at high speeds. The distribution of the interiors is the result of a careful architectural study of the volumes, which focused on excellent onboard comfort and the best, and indeed complete, separation between the guest and crew areas. As for all Mangusta yachts, the Group’s Design Department offers a range of ideas for different personalised interior layouts and style and decor solutions in order to fully satisfy the taste and wishes of each owner. In this case the Owner chose a 4 cabin layout with another salon on the lower deck (standard is 5 cabins). LiveYachting is a wiki type website where superyacht professionals, enthusiasts and businesses share information about luxury yachts.